As Cervical Cancer Awareness Month comes to a close, ADVANCE partner Fenway Health from Boston shares best practices from their clinical and research experience providing cervical cancer screening for gender diverse patients. When caring for transgender or gender diverse patients – and really, any patients – sexual health must be part of the main discussion and not relegated to the background. It isn’t enough to simply ask “are you sexually active?” and move onto the next question. When providers treat sexual health questions as more than just something to check off the list and instead open the communication with relevant and meaningful questions, patients are willing to have a longer conversation about their individual needs. Providers may make two very different mistakes when screening transgender patients for cervical cancer and other sexual health concerns. Some may assume that every patient is comfortable with their bodies and, specifically, genitalia enough that the exam shouldn’t be an issue for the patient. Or, on the other end of the spectrum, providers may be hypersensitive to potential body issues and assume that the patient is going to be resistant to having an exam because of their gender presentation. Both mistakes are the result of assuming, not asking, what the patient needs. Maintaining an open dialogue during each step of the appointment is the key to avoiding these pitfalls. 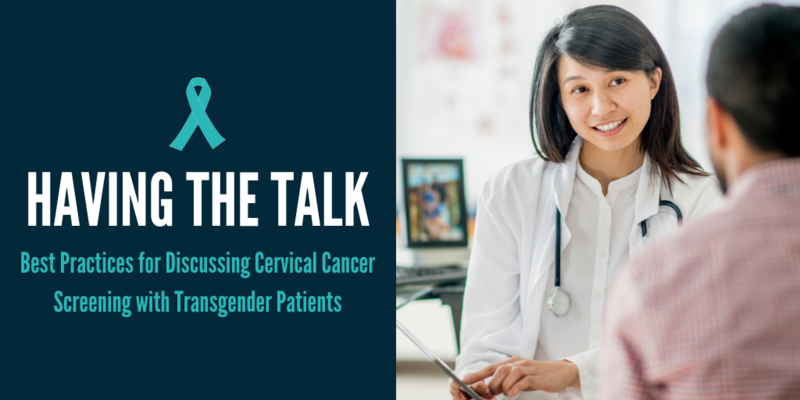 When it comes time to discuss screening, “Start by explaining why people have cervical cancer exams, and that, like any medical exam, they’re not mandatory,” recommends Julie Thompson, PA-C and Medical Director of Trans Health at Fenway. If the patient is distressed about a possible cervical exam, ensure them that they have the final say: it’s their appointment and, if they don’t feel capable of undergoing an exam “maybe they’re not ready for that today, and that’s OK.” Give your recommendations as a medical provider, but also explain that they have options, Thompson urges. Continue with open ended questions. “It looks like you’re due for a cervical cancer screening today; were you expecting that? How does that make you feel? Is there anything you’d like to discuss that you’re concerned or nervous about?” Ask patients “If they would like you to describe what the exam would be like and show them the instruments that would be used Asking “really helps to normalize these questions with the patient,” says Thompson. If the patient isn’t ready for a cervical exam that day, you can brainstorm ways that may make them more comfortable with having one in the future. Perhaps the patient simply needs to schedule an exam for a different day and have more time to prepare. Suggest that they bring a trusted partner, friend, or family member with them to their appointment for support, or bring music to play during the exam to help relax. Maybe they’d like to bring a speculum home to practice with, or have their partner practice, to familiarize them with the instrument before their appointment. Another option is for the patient to do a self-swab at home. These frontal (i.e., vaginal) self-swabs can then be brought into a lab for testing. Research has shown that people on the transmasculine spectrum are often more comfortable using this method of cervical cancer screening. Be sure to inform the patient, that self-swabs have been shown to be about 70% effective in detecting cancer cells, so they are not yet as accurate as in-clinic exams. Above all, don’t put too much pressure on the patient regarding the exam. Give them the information and support they need to protect against cervical cancer, but let them make their own decisions. Showing that you respect their autonomy goes a long way toward breaking down the mistrust and fear that many transgender people feel toward the medical establishment. And at the end of the day, an empowered patient is a healthy patient.